Last November, we asked you in a 60-second survey to share your opinions about privatization and public libraries. We just published the results of this study as a feature article in American Libraries: “Who’s the Boss? Does Private Management Have a Place in Public Libraries?”. Access the article here. The study’s results were also summarized in an earlier blog post. Thanks again to everyone who responded to our survey! Your participation and thought-provoking comments provided us with an excellent foundation from which to work as we wrote the article. We’re excited to continue sharing your opinions about hot topics in LIS in future studies. Results from the 60-Second Survey: What is the Value of an MLIS to You? Over the last two weeks of May, librarians, library staff, and library school students weighed in on the LRS 60-Second Survey “The Value of an MLIS Degree to you.” Almost 2,500 people from every state and 15 countries, representing all library types, responded. Around 1,300 respondents left comments, sharing additional thoughts on the value of the MLIS degree today. When asked if they thought their MLIS degree was/is worth the money and time invested in it, just over three-fourths of respondents (76%) agreed or strongly agreed that their degree was worth the investment. Seven percent of respondents disagreed with the statement that their MLIS degree was worth the time and money they invested in it, and another 4 percent strongly disagreed. Ten percent indicated neutral feelings toward the value of their MLIS degree. *3 percent of respondents indicated N/A and the question was skipped by 11 respondents. Respondents who have had their MLIS degree the longest were more likely to indicate that the time and money invested in the MLIS was worth it. Nine out of ten (92%) of respondents who have had their MLIS for 16+ years agreed or strongly agreed that the degree was worth the time and money they invested in it and only 8 percent disagreed, strongly disagreed, or were neutral. Almost 90 percent of respondents who have had their degrees for 11-15 years agreed or strongly agreed that the investment in the MLIS degree was worth it, as did 80 percent of respondents who have had their degrees for 6-10 years. While over two-thirds of newer professionals agreed or strongly agreed that their investment in the degree was worthwhile, they were less likely to strongly agree and were more likely to select neutral or to disagree or strongly disagree. Respondents who completed their degree 1-5 years ago were the most likely to indicate that the degree was not worth the time and money they invested in it, with 21 percent selecting disagree or strongly disagree. 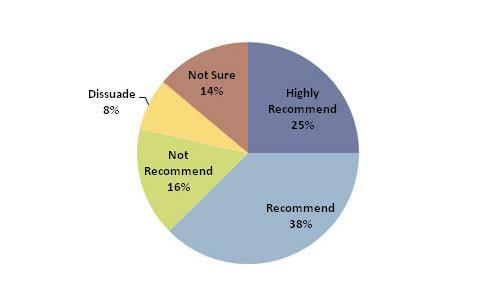 Survey respondents also indicated whether or not they would recommend pursuing an MLIS degree if asked today. Almost two-thirds of respondents (63%) would recommend pursuing the MLIS degree, with one-fourth of respondents indicating they would “highly recommend” the degree. Close to one in six respondents would not recommend pursuing the degree, and 8 percent would actively dissuade others from pursuing it. Around 14 percent of the respondents said they were not sure if they would recommend the degree if asked. If asked TODAY, would you recommend pursuing an MLIS degree? 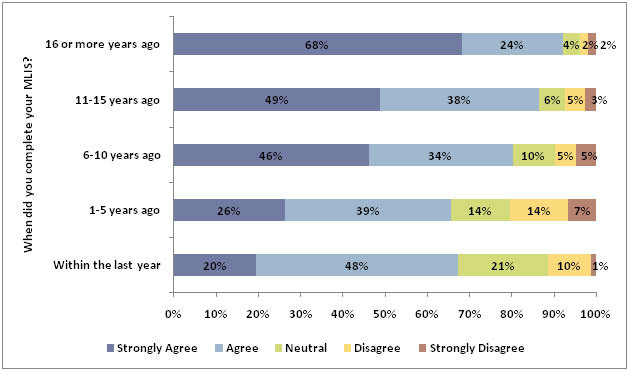 In addition to being more likely to agree that the investment in the MLIS degree was worth it, respondents who have had their degrees the longest were also the most likely to indicate they would recommend pursuing the degree to others, with three-fourths of those who have had their MLIS for 16+ years indicating they would recommend or highly recommend the degree. Around two-thirds (65%) of those who have had their MLIS for 11-15 years and 6-10 years would also recommend or highly recommend the degree to others. 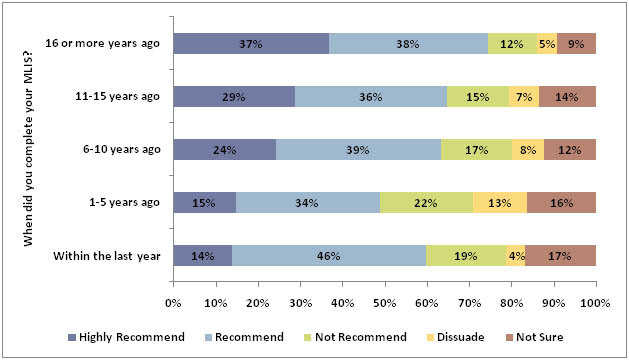 Those who have had their degree for 1-5 years were the least likely to highly recommend or recommend the degree (49%) and were also the most likely to indicate that they would not recommend (22%) or actively dissuade (13%) others from pursuing an MLIS. Stay tuned for a more in-depth report on the survey results, including a comparison with the 2008 survey results and analysis of the comments left by respondents. Until then, we’d love to hear your thoughts so far – please leave any comments below! There appears to be more competition than ever for Colorado’s library jobs, based on recent activity on LibraryJobline.org. A new Fast Facts about the jobs posted on the site over the past four years has just been published: “Colorado’s Library Job Climate: 2007-2010: Insights from LibraryJobline.org” highlights trends in total job postings, salaries, degree requirements, and the most popular jobs from the site. Job postings are up slightly from 2009, but drastically more people are viewing them, and part-time, temporary positions continue to replace full-time, permanent ones. Click on the title above to view the full report. New 60-Second Survey: What is the Value of an MLIS to you? In 2008 Library Research Service launched our first 60-second survey, “What is the Value of an MLIS to You?,” in response to lively discussions about this topic on various listservs. Close to 2,000 library professionals weighed in, with over 1,000 leaving thoughtful comments about the MLIS degree. Three years later, as libraries and the environments in which they serve continue to change and evolve, LRS wondered how has the value of an MLIS fared? LRS has launched a new 60-Second Survey on the value of an MLIS to you. Do you feel your MLIS degree was/is worth the time and money invested in it? If asked today, would you recommend pursuing an MLIS degree? You tell us. Edited to add: Thank you for your interest! The survey is now closed. Preliminary results will be posted to the blog in early June. A new Fast Facts is up! “More Job Seekers, Fewer Jobs: Findings from Library Jobline, Year Three” reports trends found in LibraryJobline.org postings from 2007-2009. While the number of job postings drastically decreased as the economy struggled, the number of job seekers increased, making the field more competitive. Click on the title above or visit the Fast Facts page to read more! LibraryJobline.org is now on Twitter! Follow LibraryJobline.org at http://twitter.com/libraryjobline. If Twitter isn’t for you, you may also sign up for My Jobline, where you can chose to receive emails and/or RSS notifications when jobs that meet your criteria have been posted. Or, you can receive RSS notifications of all job postings here! Has your job changed as a result of the recession? You’re not alone. Our latest Fast Facts, Libraries and Librarians Feeling Effects of Economic Slowdown, discusses the results of a 60-Second Survey conducted earlier this year. Respondents’ personal observations indicate requests for help and use of library services have increased, along with the stress felt by librarians. To read more, visit our Fast Facts page or click on the link above. Library Jobs in Colorado: What Does LibraryJobline.org Tell Us? Are you curious about the library job market in Colorado? Our latest Fast Facts, Library Jobs in Colorado: What Does LibraryJobline.org Tell Us?, analyzes the job postings on LibraryJobline.org since 2007. Some of the topics discussed are the total number of job postings, job postings by library type, and degree requirements. Read more about the changes (and similarities) over the past few years by clicking on the title above or by going to our Fast Facts page. In April, we launched the 60-second survey, “Libraries and the Economic Recession.” This survey was prompted by several news articles discussing the recession’s impact on libraries and librarians. We wanted to know what folks on the front lines had observed about the economy, and how the recession had impacted their work and their career plans. Nearly 500 people responded. The results indicate that libraries are indeed seeing increases in use and requests for assistance, and librarians are feeling the squeeze themselves. When asked, “In the last 12 months, have you had to help more library patrons with the following services,” 70 percent selected “computer use,” which included help with software and Internet searching. More than three in five (66%) said they’ve had more requests for assistance with job-seeking activities, such as online job applications and resume preparation. Similarly, when asked, “In the last 12 months, have you personally noticed an increase in use of the following resources in your library,” 67 percent reported increases in public access computer use by patrons, while more than half said they’ve noticed an increase in library visits (63%) and circulation of materials (54%). When asked, “To better serve patrons, do you feel a need for additional professional training in any of the following areas,” nearly half of the respondents (46%) indicated they could use training on available public assistance/social programs. When asked, “As a result of the current economic downturn, do you feel a need for additional training in any of the following areas for your own professional development,” more than two in five (44%) said they would benefit from stress management training. One in three (31%) indicated they could use additional training on how to deal with difficult patrons. In addition, more than half the respondents shared personal observations about how the recession is impacting their libraries and their patrons. More detail about the results of this 60-second survey will be published in an upcoming edition of Fast Facts. Let us know what you think about the recession’s impact on libraries by leaving a comment below.